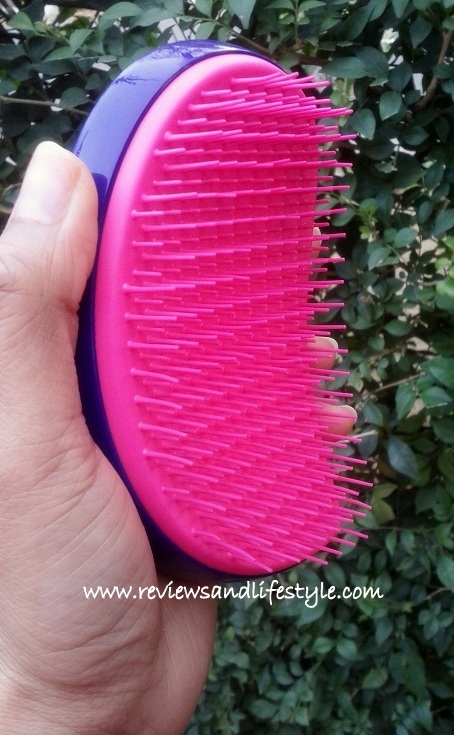 This is a review of Tangle Teezer Salon Elite hairbrush, which I am now using daily from last 6 months. I love pampering my hair with it several times in a day. I think it is the best gift I could give my hair in this lifetime. 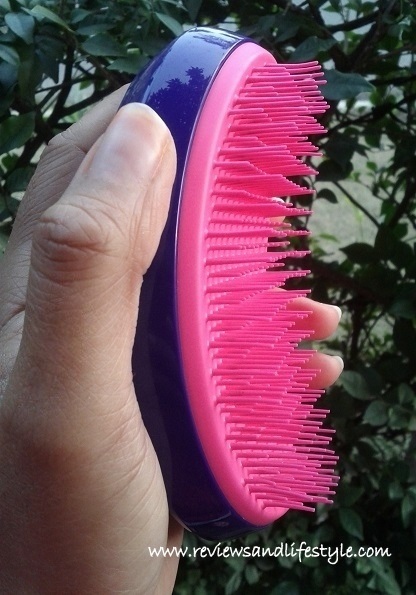 If I will ever repurchase a hairbrush in the future, it will be just this same brush, may be in a different color. 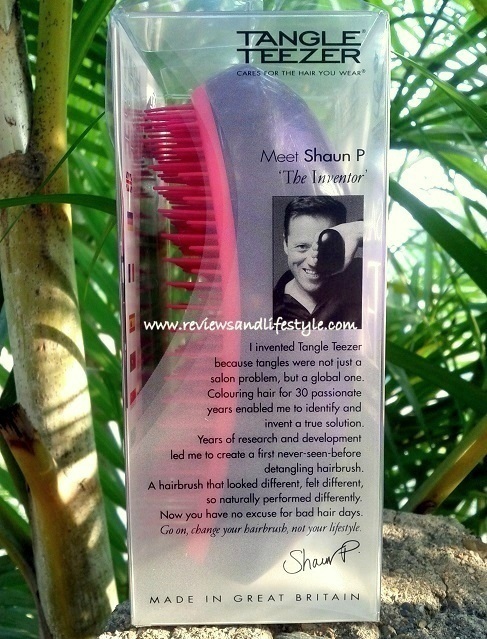 If I sound over-excited, the review below will give you a better understanding about the powerful performance of this hair tool and would help you decide if you too would like to invest in a Tangle Teezer. Tangle Teezer Salon Elite Price: INR 1199 but you do get attractive discounts on it most times and it is worth every penny. You got to use it to understand how it upgrades your lifestyle. 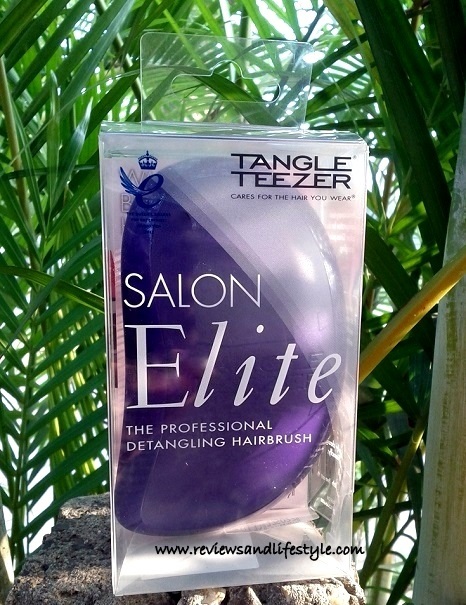 Tangle Teezer Salon Elite detangling hairbrush is a mango-shaped brush, without any handle. You can easily hold/clutch it in your palm. 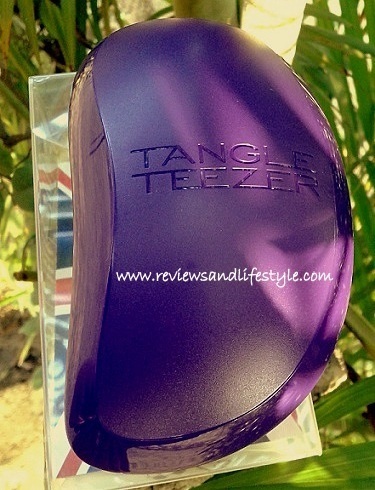 You can check the review of Tangle Teezer Compact Styler here. The upper part of the brush has a frosted finish which gives a good grip and the brush does not slip out of your hand easily. The strip at the edge has a shiny finish. 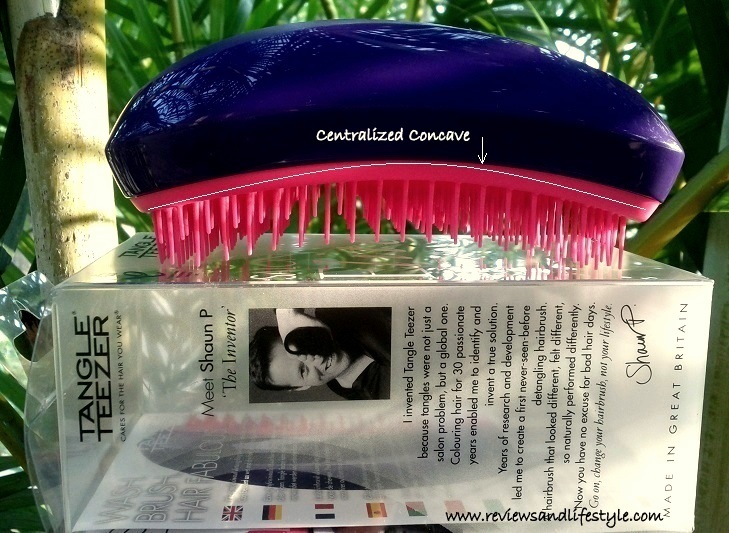 The center part of this particular Tangle Teezer is bent into a concave shape/ curve. 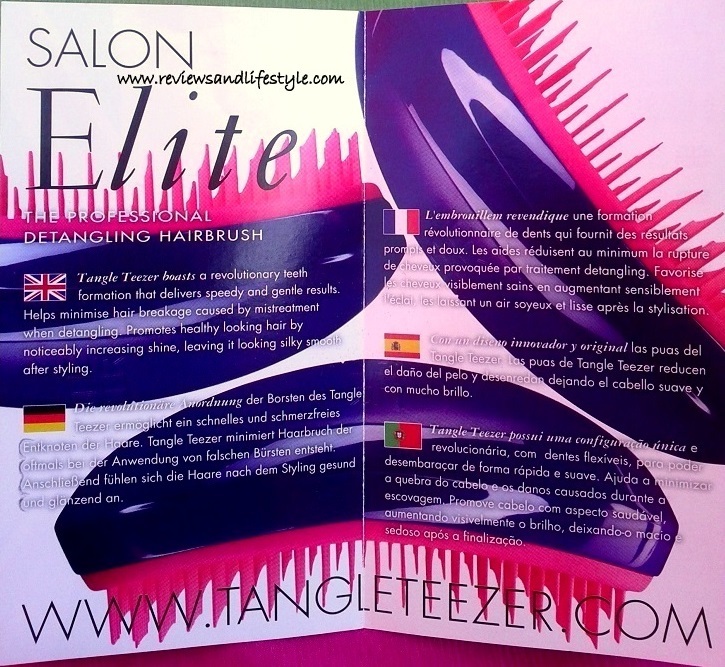 Salon Elite is the ONLY Tangle Teezer with this curved bed. All other Tangle Teezers have a flat base/bed. This special curved shape easily handles thick strands of hair, which means you can groom and detangle your entire hair by making just 4-6 sections. 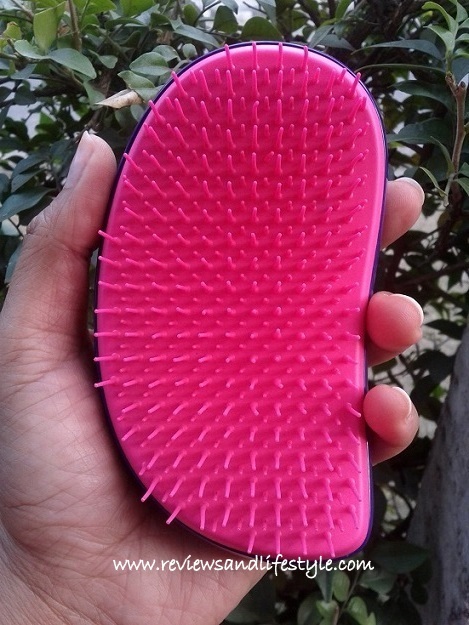 Hence, this Salon Elite Tangle Teezer hairbrush quickens your grooming speed. You no longer need to waste time and dread the pain that follows after a usual shampoo session. It is "Perfect to pick-up-your-preening pace!" as the brand says. All tangle teezers have special patented teeth/ bristles, which make them stand apart from other detangling hairbrushes. The bristles are of two sizes: long and short. 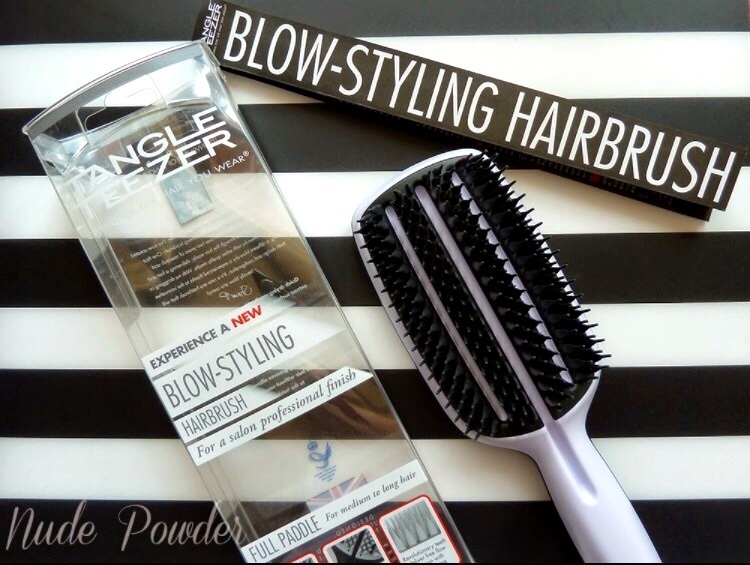 The alternate rows of long and short bristles work like magic to easily detangle hair without any tugging and pulling. This unique combination of concave shape and special patented long and short teeth eases out the tangles quickly, painlessly and smoothly in even the most tangled, thick, curly or difficult-to-tame hair. Mine are fine, very-long silky hair, and Salon Elite Tangle Teezer works perfect for me in just 4 sections and a few brushstrokes. The Salon Elite Tangle Teezer comes in 5 attractive color schemes. Mine is Purple Crush. Mine looks different in different lighting, but is actually more of a bubble gum pink as you see below. 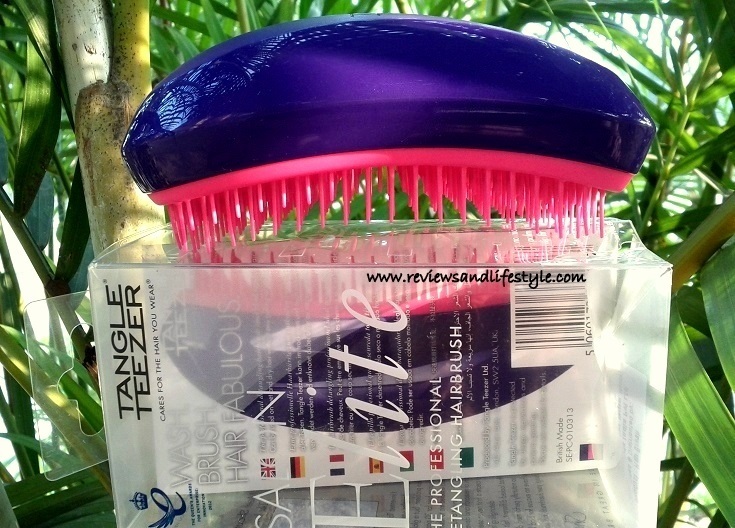 WHO SHOULD USE TANGLE TEEZER SALON ELITE? 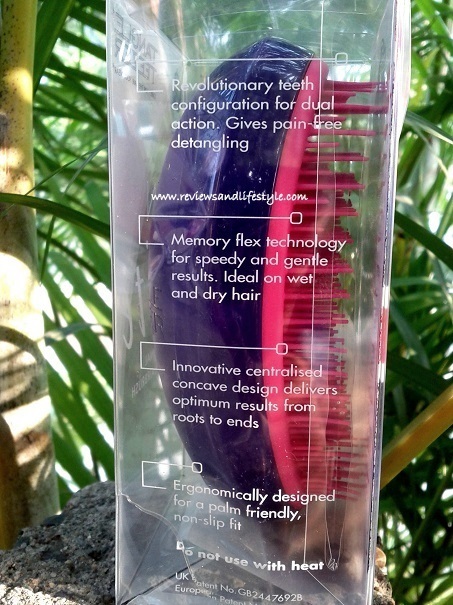 In short, any long hair that need gentle handling would benefit from Tangle Teezer Salon Elite. The Size: This hairbrush is large enough to groom and detangle very long hair: both wet and dry. Fits perfectly even in my small palm. The Shape: I love the shape! The unique centralized concave design of this hair brush makes it especially suitable to thick and long hair. Due to the concave, it can take up more hair in one stroke and neatly separate each hair strand. Innovative Teeth: All tangle teezers have the same special kind of teeth/bristles, arranged as alternate rows of small and big bristles. These special teeth detangle hair like magic, unlike other hairbrushes with same sized teeth. Quicker Grooming: Because of its concave/curved shape, it can groom more hair in one go. So it saves time by doing all your hair in just a few strokes. Absolutely Painless Detangling: I never recommend using a hairbrush on wet hair as the skin around hair roots is swollen with water and hair are most prone to uprooting. However, Salon Elite is so gentle, I can detangle my freshly shampooed hair in 3-4 min with absolutely zero tugging, pulling or pain. Zero hair Damage: As this Tangle Teezer moves through hair like breeze, there is no damage or split ends caused to hair. There is no friction, pulling and tugging as with other hairbrushes. No Hair Fall: The Salon Elite takes out only the already broken/shed hair stuck in the lengths. It does not cause any hair fall by itself and is QUITE gentle. 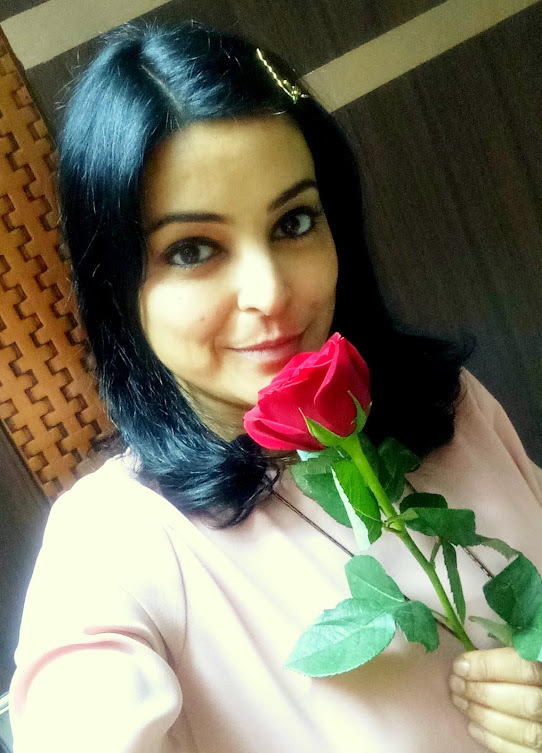 Cleans out lint from hair: If you feel a lot of cold like me and duck your entire head inside the quilt in winters, you would surely know the itchy scratchy feeling in scalp from all the lint you gather in your hair. 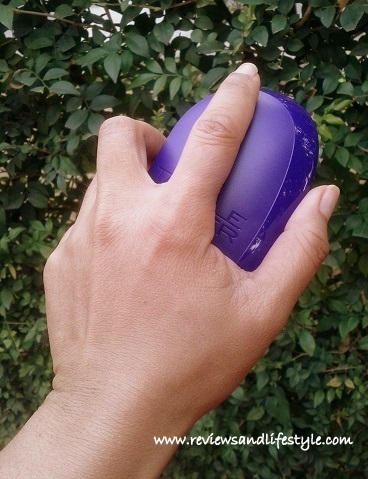 Just a few strokes with this Tangle Teezer and all the lint is out, putting your scalp at peace. Negligible Static: Static is a kind of electric charge produced in our hair during the current weather when you can see your hair standing in weird directions and sticking to your plastic comb or hair brush. 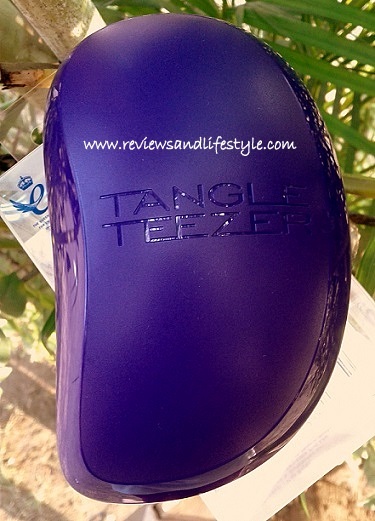 I did feel a good amount of static with the Compact Styler Tangle Teezer. But with Salon Elite, the static in hair is just negligible. Great for spreading shampoo or hair serum: One of the uses of this Tangle Teezer is to evenly distribute any hair serum or shampoo or conditioner through your hair. You just apply a little serum/ a few drops of any oil with wet hands, on the hair length near your ear/nape of neck. Then brush your hair with tangle teezer. It will automatically spread the liquid to the lengths and will deposit the right amount near the hair roots too, without making your hair limp. Easy Maintenance: This brush is very easy to clean. As the teeth a very small, you can easily pull out the hair. To clean the stuck lint, just blow air with your mouth or wash under running water. Wash with a mild shampoo diluted in water. You can also use a new/old toothbrush and shampoo for extra cleaning. Sturdy: It has fallen from my hands many times but thankfully it is intact. 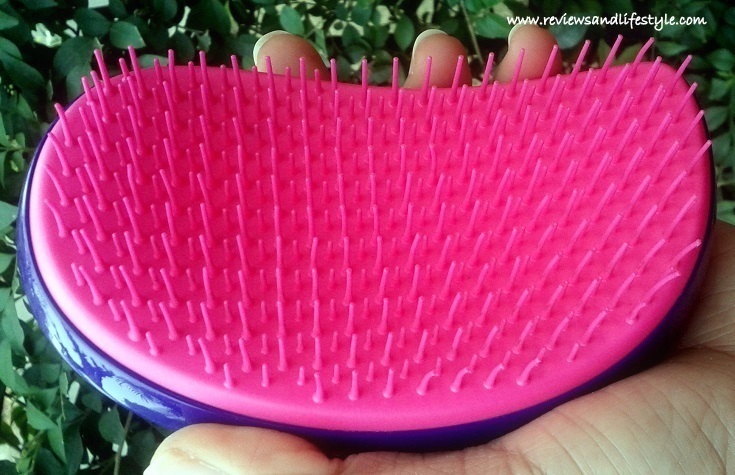 Massages Scalp: The bristles of Tangle Teezer look sharp but actually don't prick. They rather massage the scalp and increase blood circulation to the hair roots. The only limitation I know of is that Tangle Teezers cannot be used with heat, meaning you cannot use this while blow drying or heat styling your hair as it is made of flexible plastic. However, Tangle Teezer has recently introduced a new blow-styling hairbrush, but that is NOT a detangling hairbrush. That's just for heat styling your hair while you blow dry them. 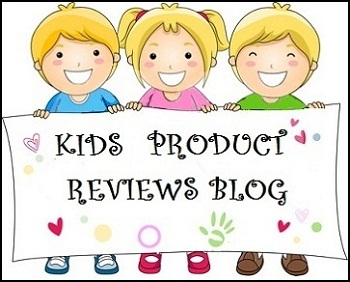 The Compact Styler Tangle Teezer I had reviewed before is perfect for kids and up to shoulder length hair. My long hair needed something faster and better, and this Salon Elite hairbrush fitted my need perfect. I chose the Salon Elite over The Original Tangle Teezer because of its special centralized concave shape. Salon Elite Tangle Teezer with concave shape has superceded every single hair brush I have ever used. All my previous hair brushes are just lying useless now. Salon Elite Tangle Teezer is THE BEST hair brush you can ever invest in. Any woman/girl who loves her hair or wants to feel special, Tangle Teezer is the answer. Guys, this makes the perfect gift to your girl/woman. 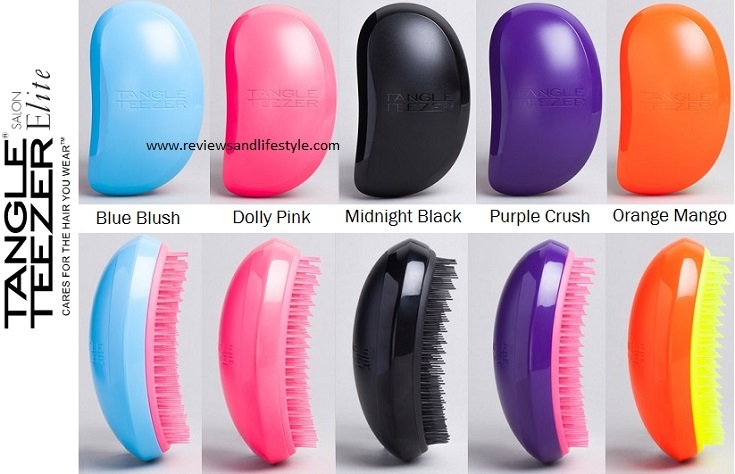 If you need help in figuring out which of the 5 tangle teezers you should buy, ask me in the comments below. Is there no difference between The compact styler and the salon elite version other than size? I have a little longer than shoulder hair which get tangled a lot and I am confused between the two. I want to buy the Compact one because of its cover and all but then I read this review where you suggested that for longer than shoulder hair, you should go for the salon elite one. 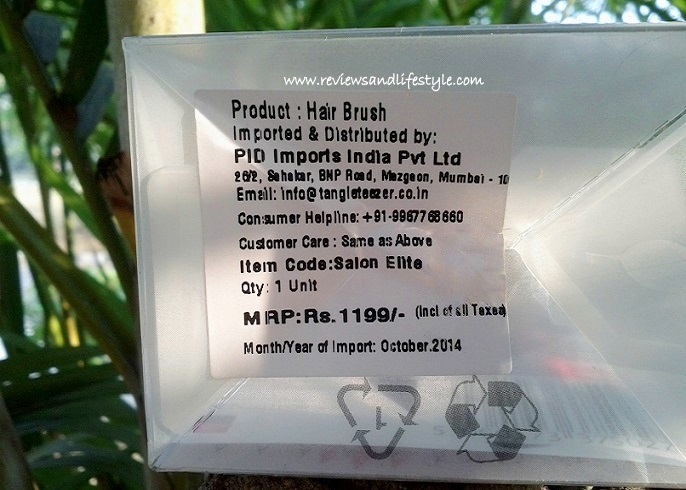 Dear Vishal, the Compact styler comes with a lid as you already noticed that feature. It is just like square chunk full of bristles. It can still work for your hair length if you have fine silky strands. But it doesn't work well on thick voluminous hair unless you have a lot of time carefully taking small strands and brushing them gently one by one. The distinct feature of Salon Elite brush is its curved bed. The bristles rise out of a curved base, making it suitable for very voluminous hair as you can control thicker locks of hair in that curved portion and brush more amount of hair in one stroke. This one is almost double in size and fits snugly in the palm. My kid has waist length/longer hair and I was using compact styler for him. But I had to do his hair very slowly and could do only thin locks of hair one at a time. Recently upgraded him to salon elite and we are able to do his hair faster and more easily than with Compact Styler. So if size of the brush is not an issue, salon elite is definitely better and less painful. Further, you can take a few drops of oil/ hair serum on your palm and rub the bristles of the tangle teezer onto that. Now brush from your ear-length downwards. This would deposit a very thin layer of oil/serum on your hair and by the time you will take the brush up to your head part, there would be even less amount of oil/serum left on it so it would detangle your hair gently without weighing them down with a heavy oily layer. Hair get tangle mainly at the nape of the neck, above that it is supported by the head and below that by the shoulders. The in between area is where we get most tangles. Try to braid or loosely tie your hair at night to prevent damage during sleep. Hope this helps. Thanks again for taking the time out to reply. It seems clear now that I should choose the salon elite version as my hair is more on the thicker side than on the silky side. For as long as I had long hair, I never combed them because of the tangles and left them unkempt. 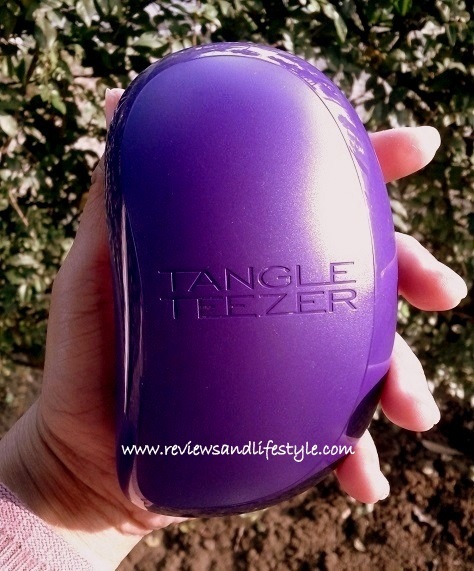 But for once, I thought why not search for a solution when I came across this Tangle Teezer. It seems like magic to a person who knows the trouble of tangles. Let's hope the magic works. 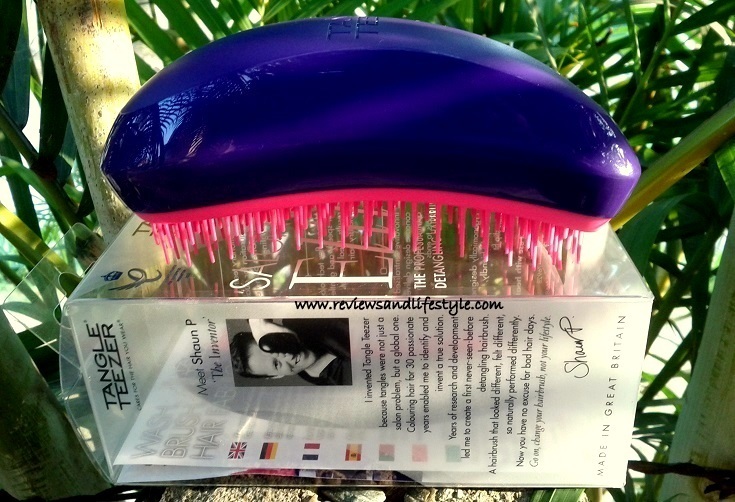 What do you think of the splash tangle teezer brush? Have you ever tried it out? Is The elite better than any other tangle teezer brush, even the flowerpot one, for a child that has very long and thin hair?